I came home tonight to a huge hug from my daughter. Bliss. A few minutes later my husband let me know camp had sent home a t-shirt she needed to wear tomorrow for field trip day. I knew what to expect, but today, I guess I’d just had it. I pulled out a youth small. The same size as the last camp t-shirt and the size used whenever she’s gotten to dye-tie t-shirts for one thing or another. On my 5-year old, a youth small is a baggy potato sack dress. I had her try it on (even though I knew it would be huge) and went nope, she’s not wearing this. No more tying it 80s style to the side. Who cares about length? The neckline and arm holes are so huge she can’t possibly be comfortable in this t-shirt. That is the exact opposite intent of a t-shirt! 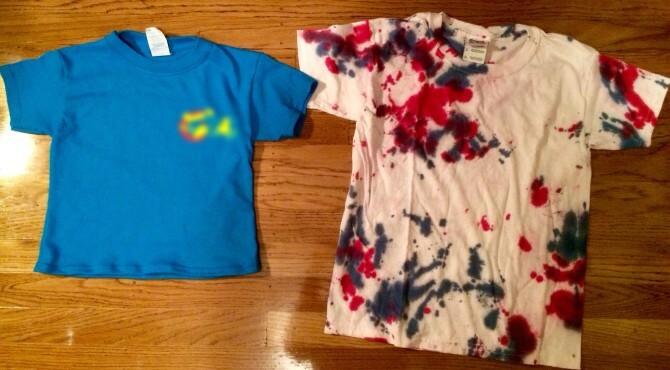 So I spent a couple hours making a shirt that started the size of the one on the right, into the one on the left. If you have a small kid and art at all crafty, knowing how to sew comes in handy a lot. So I’ll try to think more about how I’m happy I could make this a decent t-shirt for her and less about the fact that I can’t just order a camp t-shirt that fits! I wasn’t planning to make this a tutorial when I was working on it, but I’ll provide an outline of what I did so those of you out there who know how to sew have a starting point. (And for my own reference when/if I do this again.) Baisically, you cut the shirt apart & sew it back together. The only thing you don’t have to redo is finish the collar and hem the sleeves. Find at shirt the right size for your base. Fold both t-shirts in half. Cut the sleeves off on a curve, close to the seam. Line the top of the shirts up and draw a line parallel to the side of the small shirt allowing for a 5/8 seam.You may want to put this on your child to get a sense of how much of the neckline to take in. With right sides together, line up the collar so you won’t have a gap when it’s sewn. Next I remeasured against the sample shirt and noted where the armhole would start. Either with a French curve/pattern ruler (or eyeball best you can if you don’t have one) measure out the armhole on the sample shirt and then mark the equivalent on your large shirt, and cut. Measure against the sample shirt the size of the sleeves. Again using the French curve, measure and cut to reduce the sleeve length. Draw a parallel line to the existing seam on the sleeves (right sides together) measuring the width on the size of the armhole. Serge the sleeves along this parallel line. Pin the sleeves to the armholes. To hem, first serge a single layer fabric around the base of the shirt to desired shirt length. Fold under 3/8 inch and use a double needle to finish the hem. I have a few photos I’ll add later when my WordPress app stops crashing. I actually started writing this when bunny was 15 months old, but never felt like it was right. With her 3rd birthday approaching, I decided it was time to finally post. Just ask the 2-and-a-half-year-old who keeps picking her up and carrying “the baby” around while I’m writing this. Lighter kids are so much easier to carry. From about 6-7 months on, my bunny has shocked many people. “She’s sitting up so well! How old is she?” or “That is the smallest child I’ve ever seen crawl.” and now “She walks?! ?” It’s actually kind of fun to walk into a room carrying her, put her on the ground and watch jaws drop as she runs across the room. I’m reminded of this when friends come over with children about her age. Though she’ll eventually get tall enough to clear all surfaces with speed I can only imagine, we haven’t had to rush to baby proof some higher things. There are still many surfaces in my house tall enough to store items out of reach of little fingers without needs for baby locks. (I do have the truly dangerous stuff locked.) Plus, at this height there’s no way she could crawl out of her crib. I had anticipated a larger child, so our car seat fits up to 32 pounds. She rode in that car seat past 2 until she got to tall. Still, she may be rear facing until 10. Alright hopefully not quite that long for real.) Keeping bunny rear facing until at least age 2 as recommended was a breeze and we continue to because it’s so much safer. Bassinet, bathtub, carriers, Bumbo, etc. We were able to keep bunny in our room in a bassinet until 7 months. Her bathtub gets placed inside our big tub, less water & she still has plenty of play room. We are in no danger of reaching the max weight on our carrier any time soon, and she still fits comfortably at nearly 3! (Sure some carriers are rated for 30-40-50 pounds, that doesn’t mean mom or child will be at all comfortable!) We never actually owned a Bumbo, just borrowed, but I know many a child whose chubby legs would get them stuck. Much easier to get a frame and keep the mattress to avoid the giant twin bed for a while. She’ll fit this bed well past toddler years. 10 – Tiny is Just So Darn Cute! When they’re infants we marvel at how tiny they are. Tiny and cute are synonymous for many people. Even though she’s growing, I still get some of that infant tiny feeling as I marvel at this mini-person. She can move that tiny little body so well! In a group of kids, she stands out as adorably petite in a land of giants. Plus, she’s the tiniest dancer I’ve ever seen! Got a tiny kid yourself? What would you add to this list? How Does a 2-year-old Understand Death? My bunny came into our room in the middle of the night to nurse last night, as she has for more than 2 months now. After she was done, I asked her if she was ready to go back to her room. No response. I asked again and got a sigh in response. “Are you ok, honey?” I asked her. In August, I delivered a stillborn baby girl, Lorelai, a day shy of 6 months pregnant. It’s been 4 months. I think I said something along the lines of that’s right and hugged her. Then she asked me if she could walk back to her bed. So I kissed her and lifted her down off the bed. She’s repeating the words we’ve said to her, trying to explain what happened. It doesn’t make it any easier to hear them back. My husband had been half awake. We just held each other. She was back 20 minutes later to nurse some more, this time when she was done I let her sleep between us until I had to get up and moved her to her bed so she’d sleep longer. I didn’t even ask her if she wanted to leave. We were warned this would happen. We’d asked advice on how to talk to her about it and been told to be honest but simple, discuss it when she wants to, and be prepared for her to seem fine then bring it up again out of the blue as she continues to grasp the concept and think about it differently as she gets older. But I’m still not prepared. She’s used “I’m sad about my baby sister” to distract us and get attention at times. Within a couple of weeks I had to take deep breathes and learn to say calmly, “I’m sad about your baby sister, too. But you still have to eat your lunch.” This was not like that. This is even harder. My poor bunny has been through so much in the last few months. The loss of my pregnancy, her baby sister, changes in our work schedules, day care, and much more. I barely know how to deal with it sometimes. How can a 2-and-a-half-year-old? As she gets older and her ability to think about the world changes, so does her perception of this loss. That seems like an awful lot of work and burden on such a young child. I remember the day we came home from the hospital and told her. She had such a sad face. Nothing like a “I fell down and hurt myself” sad, or a “I wanted that toy” sad. This was one of grief that does not belong on such a small child. Looking from mommy to daddy crying as if to say, “no, this can’t be true.” Then switching immediately to avoidance, asking to play with toys, and for a day or two fighting sleep harder then any normal child does. (Think of your toughest nap time fight times 10.) I think it was the second night, we asked her why she didn’t want to go to bed. As she tried to fling herself from the bed she screamed and cried that she was sad about her baby sister. And we all cried. My milk had just come in so I offered to let her nurse. Her small body calmed so quickly as she nursed and she fell asleep. (She’d nearly self weaned until then, unhappy with the taste of colostrum while I was pregnant.) Honestly, I was grateful to have her nursing, because it calmed me, too. And now life continues, though it felt like it should have stopped. So much has changed and it doesn’t get better – I just get stronger. But I won’t let myself get hard. I don’t want to be that type of strong. When bunny wants to talk, I will talk honestly. She was supposed to have a baby sister for Christmas. She won’t. But she’s getting toys from Santa and time with family that loves her. I hope that’ll be enough for her. That she will feel loved. I don’t wish that she will forget her Lorelai, but that she will continue to love others for her whole life, the way she loves her baby sister. Category Uncategorized | Tags: | Comments Off on How Does a 2-year-old Understand Death?